At this point you should probably be getting used to my non-dairy shenanigans. I'm (probably) never going to love these things, but I can't resist the urge to try at least one of the new bars. I decided not to go with the Almond version because I wanted to get a true feel for what they were up to and the almonds in the shell would have thrown me off. Ha, I like that the wrapping matches the box, nice touch. I take a bite and it's not bad!! 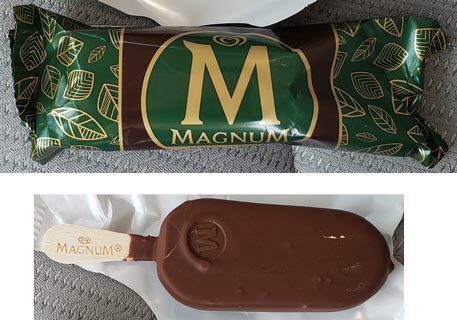 Granted, Magnum has their excellent chocolate to distract me from whatever is going on in the middle here, but I like it. The inside is cold and non-offensive, just the way I like it! If I had to describe the insides, I'd say it's something akin to vanilla Rice Dream, but with a better texture. The really shocking thing here is that the three main ingredients to this filling are water, sugar, and glucose syrup (which the box says is composed of wheat and corn). Besides the chocolate shell, every other ingredient is under 2%. I'll be honest, I'm impressed. With so many of these weird, airy, super low cal products out there, I thought this was just some bizarre gimmick, but it worked! Props to Unilever for this one off. On Second Scoop: I've finished off the other two bars now and I'm still impressed. I'm not saying there isn't any weirdness here, nor am I saying these are the best treat ever, but they do make it work in this form factor and you have to give them credit for that. Give these a try if you are interested (or lactose intolerant). This is shockingly more favorable than I anticipated. But, I’m not anti dairy and there’s no nutritional benefit, so I’ll pass. I’m sure there is an audience for them, though. 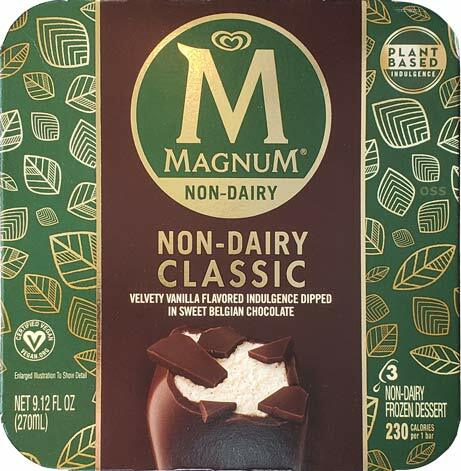 Wow, looks like there's roughly 20% more saturated fat in this non-dairy bar than in the Magnum classic ice cream bar. Kudos to Unilever. Where else are you going to find a plant-based product that has 118% added sugar and 152% saturated fat? They could had gone with a different packaging design. I thought it was a mint flavor at first. 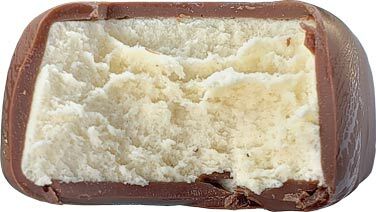 I would be pissed when I bit in that and no mint flavor. Yes, Kotoko and Dubba. Point taken. Maybe it was me who was initially fooled by the "plant-based" label on the front. It sounded so healthy as if it would be filled with avocados or some type of pea protein that other "healthy" ice cream products use. Not trying to rain on anyone's dessert parade. I do know the label is accounting for 3 servings; I would eat all 3 if it was up to me. No worries, I'm not a fan of this new thing where there are individual servings in a box yet they show stats for if you eat the whole box.